The ‘academization‘ of the English schooling system has been much-remarked, but there has been relatively little systematic work studying the politics of this process. In a new paper, forthcoming at Public Administration, I document both the magnitude of the phenomenon of academy conversion and some intriguing features of its underlying politics. On the magnitude of the change that is underway, the figures are rather stark. 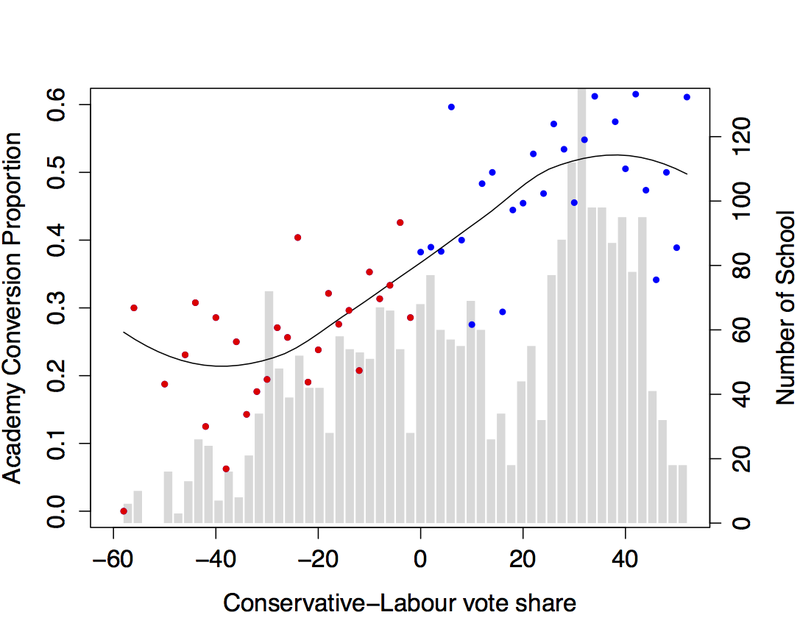 Using data from January 2013, one third of secondary schools had converted by only the third year of the push by Michael Gove and the coalition government to foster this change. Perhaps more importantly, these expressions of interest clearly drove the same pattern in actual conversions to academy status, as well. 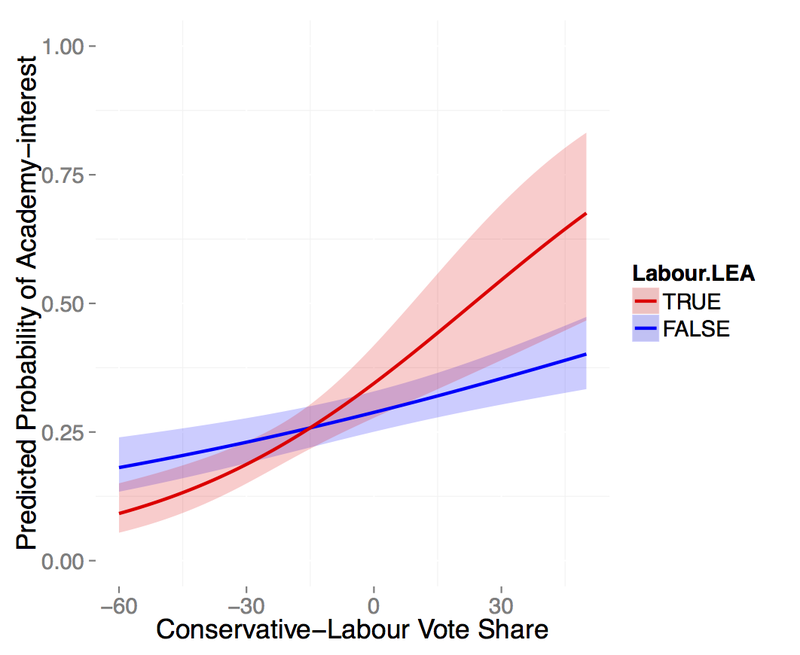 Meanwhile, I do find evidence that schools that find themselves in more strongly Conservative-voting constituencies but under a Labour-controlled LEA are particularly likely to convert. 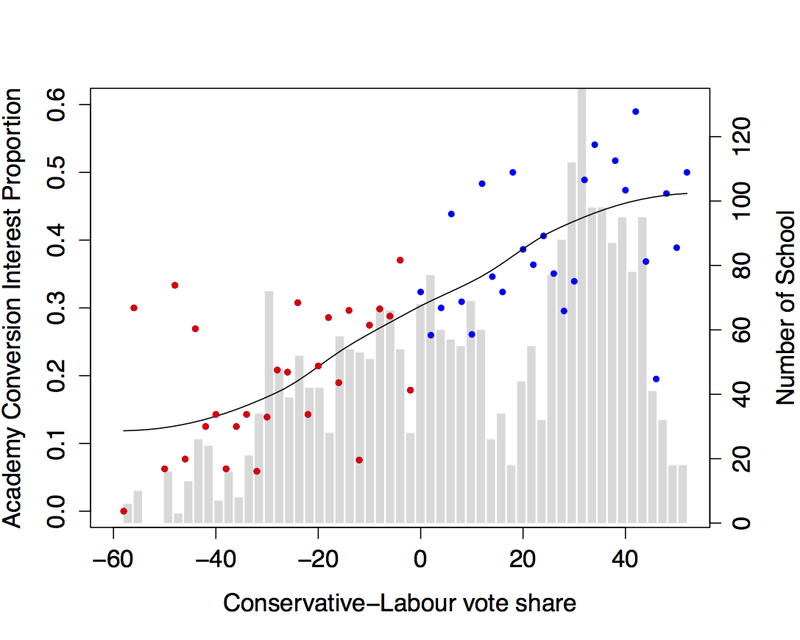 Conversely, schools in more strongly Labour-voting constituencies and under a Labour-controlled LEA are less likely to convert. It appears that schools may be using academy conversion as a way of avoiding “governance” from above that comes with a partisan flavor that does not fit with the more local political environment. For much more detail, see the pre-publication draft of “Partisan Governance and Policy Implementation: The Politics of Academy Conversion Amongst English Schools“. I am an Associate Professor in Public Policy at University College London. This site provides details of my background, my teaching, and my research interests.